SDI (HD/SD) and component input. The BT-LH80WU 16:9 HD/SD LCD monitor is a versatile, low cost, solution for studio and field monitoring. 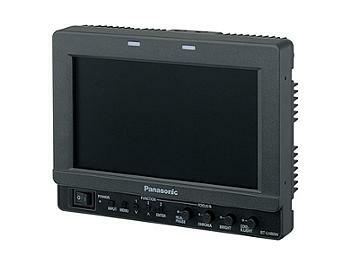 The compact 7.9" multi-format LCD monitor features advanced video processing technology and delivers high-resolution (800 x 450 pixel) playback and production-quality performance with advanced focus assists for critical focusing in HD. The LH80 is ideal for use in dual rack mounts and mobile vehicles. The BT-LH80WU handles almost any format in standard or high definition and can be customized to switch between them automatically. There is no flipping a switch, accessing a menu, or turning a knob. The LCD will display the input signal as a waveform image. This can be vital for proper color correction and white balancing, especially when conditions make it hard to calibrate by eye. The included CineGamma function, specifically designed to be used with the Varicam, provides the camera operator with precision color reproduction. A 170o vertical and horizontal viewing angle ensures that you can continue to view the LCD no matter where you are. This can be useful during productions where space is limited. The ability to conserve energy in the field is especially important when shooting without access to a constant power source. The BT-LH80WU consumes a very small amount of power, making it ideal as both a field monitor and personal viewfinder. The optional RAK-80 can be used to house two LCDs side-by-side in a standard 19" racking system.